Summer is at its peak now and to beat the heat, what better than our lassi. Lassi is a popular drink from India, essentially made with yogurt, spices and sugar, and also with the addition of fruits. I already made mango lassi few times and wanted to try with peach this time. 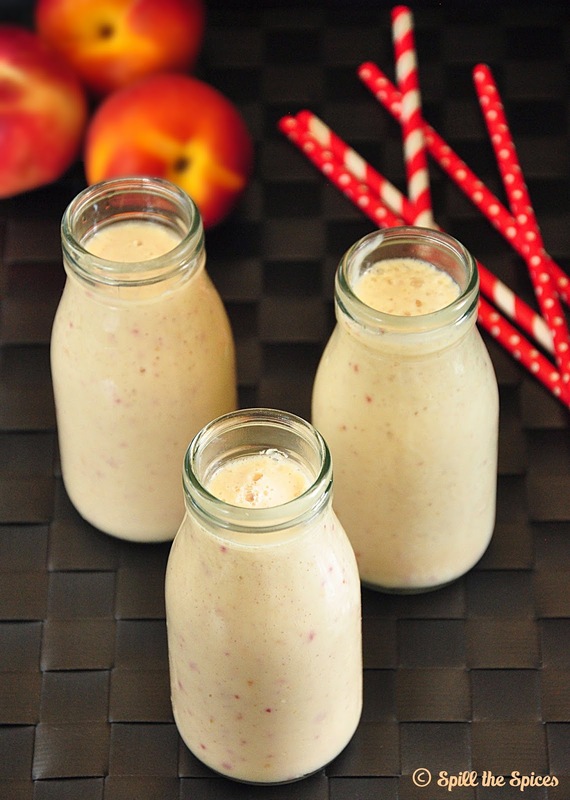 This peach lassi is twist on the classic Punjabi sweet lassi. I added juicy fresh peaches to my sweet lassi recipe and some cinnamon too as it pairs well with peaches. I absolutely loved this lightly spiced peach lassi and has become one of my favorites now. So if you get some peaches next time, do try this out and I'm sure you will love it! 1. Cut the peach in half and discard the stone. Roughly chop the peaches and add to a blender with sugar/honey, cardamom, cinnamon, cumin powder and salt. 2. Puree until smooth. Then add yogurt, rose water, milk and blend until everything is combined well and smooth. Pour into glasses and chill until ready to serve. 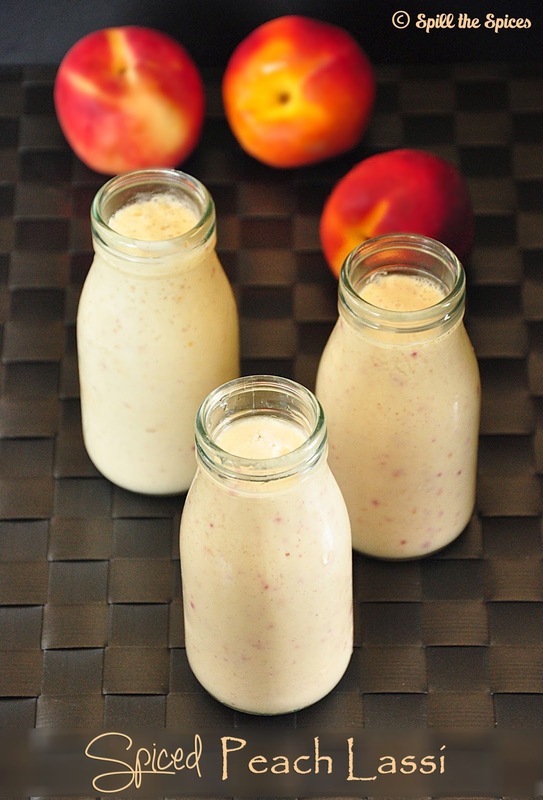 You can also make a regular peach lassi without spices and rose water following the mango lassi recipe. Milk is added to thin out the lassi. You can add more or less depending on the consistency you prefer. Do not add more rose water than mentioned, otherwise it will overpower the taste of peach. You can also use canned peaches if fresh ones are not available. Very tempting dear.peach lassi looks too good .. In love with those clicks. Beautiful clicks Sona. Peach lassi sounds so innovative and delicious. peach lassi sounds very interesting! awesome pics as always. Loving this, I don't think I can find fresh peaches here, might be I can do it with peach preserves..
loved the bottles and the drink too..looks filling n yummy ! Nice one Sona..Super clicks and love those bottles..
Fabulous clicks. Innovative lassi recipe with peaches, sounds delicious. Loved your clicks Sona and those cute bottles too. Peach in a lassi sounds yummy. this looks and taste must be awesome. such a lovely drink. Must be tasting really delicious. Love the bottles. Love this recipe and your add of cumin! Have to try it! 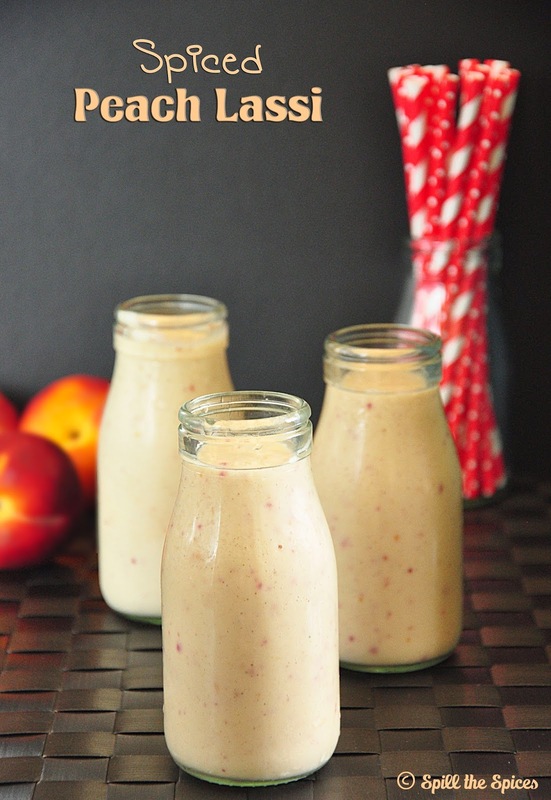 spiced peach lassi looks delicious.